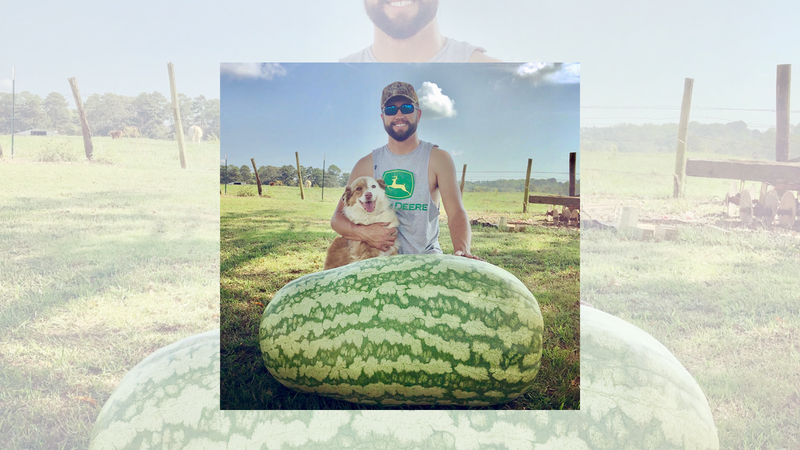 Battleground resident Daniel White’s melons are breaking records- again. One of this year’s crop weighed in as the new state champion, a whopping 288 pounds, at the 2018 Pumpkin and Watermelon Weigh-Off at Bear Wallow Farm in Nancy, Kentucky in September. White has been growing watermelons for several years. That in itself isn’t unusual; a lot of Cullman farmers grow watermelons. What is different about White’s melons is that it practically takes a forklift to get them off the ground. He’s been growing these giant melons for five years. He started the seeds inside his house around April 10 and then planted the plants outside the first week of May. “After four consecutive years of babysitting watermelons from April to October, I decided to take 2017 off and got back to the melon madness for 2018,” he said. “I put radios out there to try to scare the rabbits off, but that didn’t work, so I bought the rabbit repellent stuff, and that didn’t work, either. Finally, I built a small chicken wire fence around the melons that held the rabbits at bay for the most part. I will have a rabbit-proof fence around the patch before the start of the 2019 season!” he vowed. Each year White’s goal melon weight is to beat his personal best. “Mother Nature throws a multitude of issues our way from too much rain, insect problems, plant disease issues and of course, critters, so beating your personal best isn’t always easy,” he said. White usually names the melons, mostly for tracking purposes, but it adds a little fun to it, too. “I’m a huge older country music fan so when it came time to name the melons this year, the Statler Brothers came to mind. I’ve always been a fan of the Statler Brothers, The Oak Ridge Boys and that kind of music so it seemed to be a natural fit. We had the full Statler Brother lineup this year with Harold, Don, Phil and Jimmy all weighing well over 200 pounds each,” he laughed. The melons grew up listening to “Counting Flowers on The Wall” and other hits made famous by the Statlers. Some folks say these melons are good to eat, but they’re usually over ripe by the time Daniel cuts them. Some growers use sprays that are labeled for things like shrubbery so it’s not safe to eat one because of that unless you know your grower or grow it yourself. White advises that as far as fertilizer goes the main thing is to soil test and add amendments in the fall. Kids are usually too fascinated by the melons to say much when they see them for the first time. However, White said that if he’s learned anything after traveling to Kentucky twice in three weeks, it’s that hauling 250-plu- pound watermelons down the Interstate is like a rolling circus. “Folks will pass you and then back off so when you pass them, they’ve all got their phones out taking pictures of the melons sticking up above the sides of the truck bed,” he laughed. According to one source, White’s watermelon holds seventh place in U.S. history for the largest watermelon at 288 pounds. The largest melons by year, 2013-105 lbs., 2014-208 lbs., 2015-243 lbs. (broke the state record that year), 2016-237 lbs. (the seeds he saved out of the 237 grew the 288 this year). He took 2017 off and this year had 255 lbs., 238 lbs., 288 lbs. and still has one growing but it’ll also be over 200 lbs. Daniel White’s melon, “Don” is the 288 lb. state-record melon for this year. The world record melon was grown near Pigeon Forge in 2013. It weighed 350 lbs.